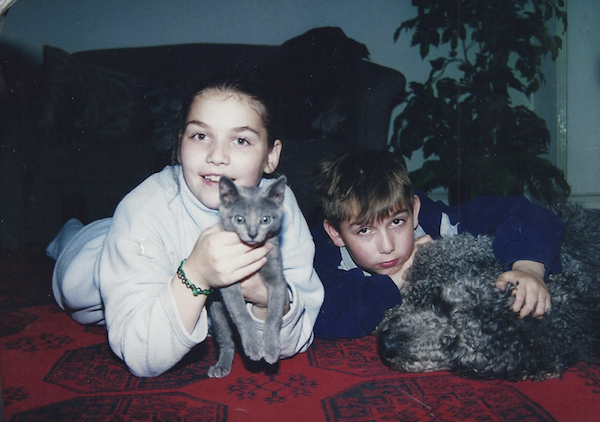 As a student in Moscow in the late 90’s, my wife Sonja decided it was time to own a cat. As a kid, her parents had always refused to allow a cat into their apartment. Now that she was 18, those rules dissolved and nothing could stop her. It was time. She hopped onto that city’s magnificent metro and headed across town to Ptichii Rynok, the large and bustling open air bird market where Muscovites have bought their pets and animals for centuries. Since she was a little girl Sonja had desperately wanted a cat and more than any other kind of cat she had her heart set on a Russian Blue. Russian Blues are known for their friendly familiarity with people and for being hugely affectionate animals. They have a unique grey-blue colour and an especially dense, double layer of fur that helps to keep out the cold of the Russian winter. They are friendly and playful and actively seek out companionship, preferring to be with people than to be alone. In many ways, they are more like dogs than cats. It was a typically cold and miserable March morning in Moscow when Sonja arrived at Ptichii Rynok. She made her way through the thawing snowy sludge that is typical of that time of year and excitedly started the search for her kitten. After wandering the market for a while, she found an elderly couple holding exactly what she had been looking for; a tiny mewling Russian Blue. They had travelled the 14 hours by train from Samara, Russia’s sixth largest city to sell their kittens at the market. Besides the one they were holding, they had another four kittens inside a plastic box, sheltered from the cold with a fluffy blanket. Each kitten took a short turn outside to catch the eye of customers walking past. As she asked to see the others, they handed the tiny kitten to her to hold while they opened the box. Now it might have been a clever sales tactic, but the moment she held the struggling little bundle of claws, Sonja felt a powerful bond form and she knew she simply could not hand it back. She had been adamant that she wanted a female for her small 36m2 apartment. This was a wild-eyed, naughty tomcat. She did not care and eagerly asked the price. “$300”, came the devastating reply. This is why the couple had made the long trip. A litter of five Russian Blues was worth $1 500 in the booming Russian capital at the time, a massive amount of money for provincial Russian citizens slowly coming out of the communist system. Sonja’s heart sank and she just stood there cradling the little cat which was now purring and nestling deeper into her winter coat. She had $15 in her purse and as a student that was all she could afford at the time. She is still not sure whether it was simply the look on her face or the way the kitten snuggled into her arms for warmth but something about the scene weakened the hard bargaining resolve of the Samaran kitten sellers. The husband told her that if she paid them everything she had in her purse, they would let him go as they could see their kitten would go to a loving home. How very right they were. Over the next few years Salvador tore Sonja’s little apartment on Leninsky Prospekt to pieces. He shredded the furniture and peed on everything he could reach but she loved him to bits. He had found his human and all that renowned Russian Blue affection came pouring out. He went with her when she moved to Belgrade and to Montenegro after that. He spent his days terrorising the family poodle Alf and brazenly picking fights with the local feral fishing cats in the little coastal village they stayed in. Finally a few years after Sonja and I met in Split, Croatia, in 2003 Salvador arrived in Johannesburg. 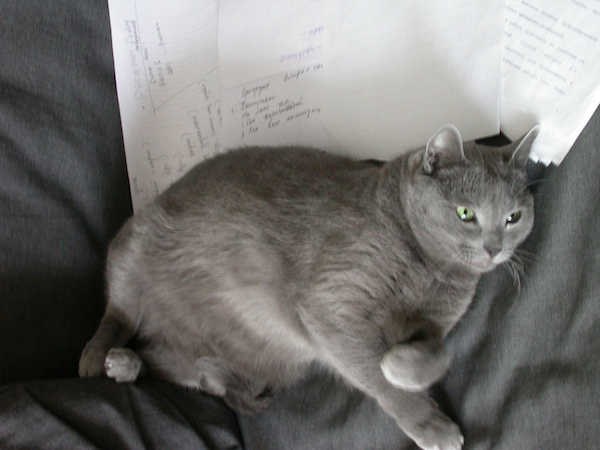 By this stage he was known as Debeli (Fatty) because he was a rather tubby 7kg cat. His youthful energy had dissipated to the point where he was a pretty sedate furry cushion on the couch most days. As the years ticked by Fatty hunted less and spent the evenings indoors, preferring a warm lap to his dusk patrol of the garden. He settled in well and loved the mild Johannesburg weather with the exception of one late afternoon hailstorm that pinned him under a tree, wailing louder than the storm itself. Sonja naturally ran into the hail to bring him inside. Provided with this context, you will appreciate that what happened next was a massive blow. At the age of 12, Salvador suddenly and inexplicably started losing weight. Week after week he got weaker and leaner until, within a few months, he weighed half of what he had before. The bones of his spine started showing and his head started to drop. We took him to the vet and they ran tests for serious illnesses and found nothing wrong. The usual suspects of feline AIDS and cancer where tested for and discarded as possible causes. We took him to another vet with the same results. The vets both started to prepare Sonja for the worst. At 12 years, Salvador was considered old and they surmised that he probably had the beginnings of organ failure of some kind. To use the typically dry turn of phrase from his native Russia, Salvador was “circling the drain” and I was facing the prospect of an extremely depressed wife. By now you will understand why Sonja simply could not accept this conclusion. They had tested for every debilitating disease they could and everything had come back negative. Sonja saw that as a positive, a chance. He did not have a serious disease so something else, hopefully less life threatening, could be wrong with him. More than just a pet, Salvador was the one constant, loving feature in a life that had shifted from a turbulent upbringing during the crumbling of Soviet Russia to post war Serbia and Montenegro and finally to a new start in South Africa. He was family; 12 years of love, stories and history. 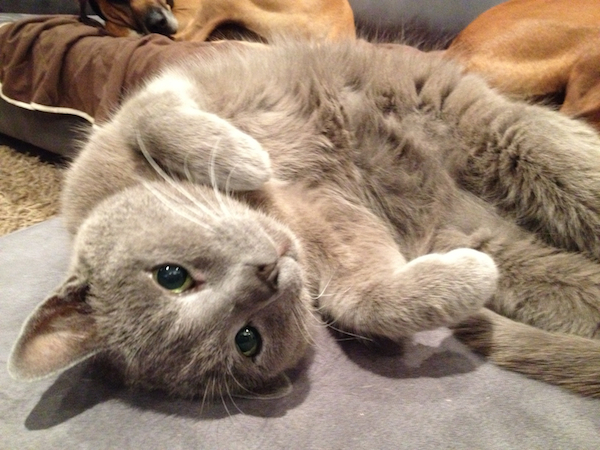 He was a companion and a friend, a character and certainly the most affectionate and loving cat I had ever known. She was devastated by the prospect of losing him. Sonja decided to do the only thing that she, as a post-doctoral academic, could. She started to read. She googled his symptoms, read what came up, followed the leads and googled some more. She read blogs and comments, articles and academic papers, textbooks and websites. She woke up at 5am and read before work. She read over lunch and into the night. Slowly a picture started to emerge that made sense and something clicked. Salvador had always had a turbulent and irritable stomach. Although he was on the best food that money could buy in South Africa at the time, Sonja discovered that the food he was on was, somewhat surprisingly and disappointingly, made predominantly from grain. I would like to pause and make a point here. Our domestic cats are carnivores in the very purest sense of the word. There is very little difference between Fatty and a wild cat besides maybe his markings, his size and his annoying desire to climb under a heavy duvet in winter. One look at him will tell you he is an urban predator; a pocket tiger. His teeth are made for ripping meat, his claws for catching prey. His eyes are located in the front of his head for stalking. He has incredible strength, speed and agility and even as a fat, unfit slouch he would regularly bring mice, lizards and birds into the house as gifts for Sonja. He has yet to bring in a piece of bread or steal a mielie from the table. He is a meat-eating machine, not a plant-eating herbivore. So it turned out that Fatty the carnivore appeared to have been raised predominantly on a diet of corn and starch. The small amount of meat that was in the food also turned out to be of very low quality making it far less bio-available for absorption in the digestive tract than higher quality meat would be. It was arguably hardly food fit for a cat at all. He had been fed junk under the label of premium quality his entire life and it was catching up. As a younger cat he pulled enough goodness out of the food to keep going but now his older body could no longer absorb the nutrients in poor quality, species inappropriate food and he was losing ground fast. Cats, it turns out, have evolved to have no carbohydrate requirement and therefore handle them very badly indeed when they encounter them in their food. Their systems are built rather to process fats and proteins. It will probably come as a surprise to you then that the US Food and Drug Administration does not allow the disclosure of carbohydrates on pet food packaging. For some inexplicable reason, all other nutrients must be listed in the guaranteed analysis but not carbohydrates. It is widely surmised that after successful lobbying by many of the massive multinationals that manufacture these foods, the US declared that no bag of cat food or dog food is allowed to disclose the amount of the nutrient most likely to cause them harm. Why? Because people started noticing what Sonja noticed and started asking why their cat foods were full of corn. The response of most big pet food companies was not to do what was best for the animals and reformulate their foods to contain more meat and less carbs. They chose rather to hide the fact that their foods contain massive amounts of carbs with obstructive and inexplicable legislation. The question that needs answering here is why we are feeding our cats – and dogs it turns out – grain and plant proteins instead of meat in the first place. It is fairly clear that they have evolved to need the latter. Like so many other ethically flawed situations in our world, the answer seems to involve large corporate multinationals and profit. It is far cheaper to formulate and manufacture food in high volume using grain and pump the savings into massive marketing campaigns than it is to use expensive ingredients and market more truthfully and sparingly. The expensive marketing will convince you that you are buying the very best for your pet but the cheap ingredients on the back of the bag do not corroborate this claim. A product made by mixing grain for bulk, plant proteins to replace meat proteins, cheap meat by-products and rendered animal derivatives to meet minimum requirements and finished with flavouring and powerful chemical preservatives may well keep your pet alive but it will not thrive. There is mounting evidence that the higher incidence of diabetes, urinary tract issues, certain cancers, liver and kidney problems and many of the ‘softer’ issues our pets experience so regularly now such as allergies, joint issues, irritable bowel syndrome, and obesity are a result of a poor quality food and a biologically inappropriate diet. We don’t feed steaks to horses. Why are we feeding maize to cats? In fact the one time we did start feeding meat to cattle, we got Mad Cow Disease for our trouble. Millions of years of evolution can’t be overlooked here and we do so at our peril. I am not saying that cheaper commercial foods do not have a place. Feeding dogs and cats on fresh meat can be expensive and more economical options are definitely needed. My issue here is that you can’t in good conscience feed a carnivore on a predominantly grain and plant based diet, market this diet as though it is predominantly meat and then turn a blind eye to the side effects of doing so. “Chicken”, “Lamb” or “Beef” covers the front of the bag in huge letters with juicy pictures while your first ingredient listed is cereal or maize in fine print on the back. It is misleading and it is wrong. Ingredients are always listed in the order of precooked weight starting with the ingredient making up the highest proportion of the food. If the first ingredient is a grain, you can be fairly sure that you are feeding your cat something that it was not built to eat. Pets obviously don’t have a voice to object. We buy or rescue them, lock them up in a house or garden and feed them. They don’t get to choose their food and when you are hungry enough you eat what is put down in front of you. We put our trust in the companies that manufacture these foods to make sure that our beloved animals are getting the best possible nutrition. I believe that mandate has been abused. If we simply can’t afford to feed them what they are built to eat and what they need to survive, then there is a poignant question to answer about whether we should breed and own them in such numbers at all. Sonja found a high-quality, meat-based food for Salvador and converted him onto it. He regained some of the weight he had lost, coming to a halt at a far more athletic 4.5kg and is in the best shape of his life at age 15. He behaves like a kitten again for the first time in a decade. He regularly jumps onto the back of my 50kg Ridgeback, demands his respect and gets it. His stomach is still a weak link in his health, however, and we fear that damage may have been done by years of inappropriate food. If you would like to know more about pet food and how various foods rate, you can go to independent pet food rating sites such as www.dogfoodadvisor.com or www.dogfoodanalysis.com for dogs or to sites like cats.lovetoknow.com/dry-cat-food-ratings for cats. Disclosure: Sonja’s journey with Salvador has led her away from Russian art history and icon restoration to a new career in biologically appropriate foods in which I am also involved part time. I purposely did not and will not name any food brands in this article as I believe that the central purpose and message here is simply to make an informed decision based on current thinking and your own research. Know what your animal’s biological needs are and be cynical enough to turn your bag of food around and read the ingredients carefully. There are bad products out there and there are good ones. You need to know which you are feeding to your pets.